Notes: Built in 1927 by Cincinnati Car Co. Description: Chicago Aurora & Elgin Railroad 431 at the terminal along the Fox River in Elgin, Illinois, date and photographer unknown (about 1955, based on the automobiles), scanned from a 2¾X4½ print, Chuck Zeiler collection. Number 431 was built by the Cincinnati Car Company in 1927, one of 15 in the 420-434 road number series, equipped with Baldwin trucks and four GE 254 traction motors, two GE C165 controllers, and had seats for 54 passengers. Description: Built by Cincinnati Car Company in 1927. 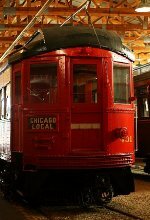 The following is from a sign on the car: The Chicago, Aurora & Elgin operated from the Loop to Wheaton, with lines to Aurora, Batavia, Geneva, and Elgin. Unlike most interurbans, power was distributed by a third rail. The 1953 opening of the Eisenhower Expressway, cutting the lines direct access to the Loop, soon led to the end of passenger service. Much of the lines right-of-way is now part of the Illinois Prairie Path. CA&E 431 is one of fifteen similar heavyweight steel cars, whose interiors were far more plush and comfortable than streetcars or elevated car of the same era. It carried commuters in both main and smoking compartments until the end of CA&E passenger service in 1957. The car was purchased by IRM, and arrived at the museum in 1962. It is operational, but is being restored. It is the only steel CA&E car in Illinois. Description: CA&E 431 prepares for the day's work. 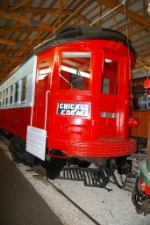 Description: Interurban coach, built by Cincinnati Car Company in 1927. 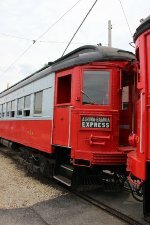 Description: Interurban coach, built by St. Louis Car Company in 1945. 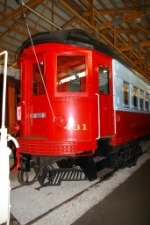 Description: Parade entry #10 - Interurban coach built by Cincinnati Car Company in 1927. Description: The North Shore, the South Shore, and the CA&E. Description: At one time #431 was the only CA&E steel car in the IRM Collection. Now operating with the restored Trolleyville cars makes for quite the sight. Description: The unique sights of IRM. Description: For many years this was the only CA&E steel car in IRM's collection, thankfully now it has a few of its former stable mates to train up with. Description: With new yards under construction, track #2 was used for equiment storage this past winter. Description: With light visitor traffic, CA&E #431 is more than capable of holding down train service by itself.